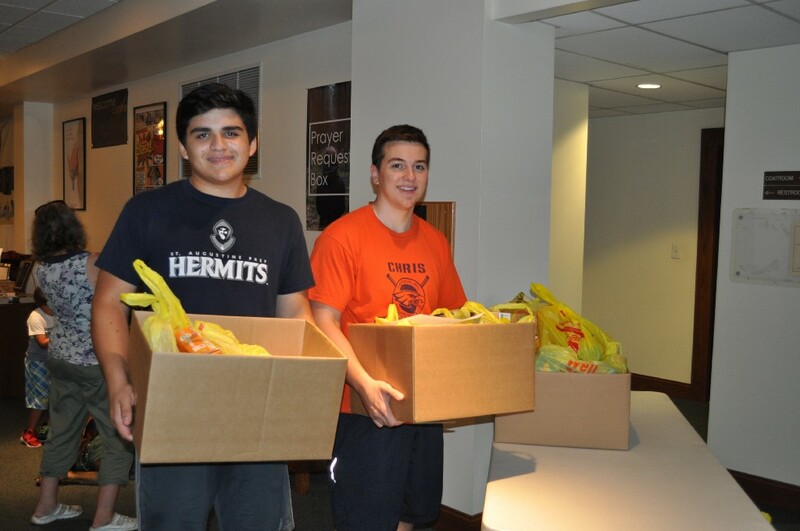 Volunteers Mike Mackley, 16, and Zach Miller, 17, of East Greenwich, help a guest carry their food items to their car at the Your Place at the Table food pantry, located in Trinity United Methodist Church. When Kristen Skrobanek of Mullica Hill started Your Place at the Table five years ago, she wanted to create a space for people to feel welcomed, loved and heard. The monthly food pantry not only provides residents and community members in need with supplemental groceries, but provides a new element each month for guests to attend, such as a budgeting presentation or pancake breakfast. The pantry originated as a result of a community service project Skrobanek and five additional families put together at the end of a Bible study. Each family put together a box of food for low-income housing and delivered them to the families who lived there. However, Skrobanek said, something didn’t feel right knowing their one box would soon be empty again. It was then she took the initiative to start a local food pantry out of her church. Your Place at the Table volunteer Julia May gathers food items to fill a guest’s request at the food pantry located in Trinity United Methodist Church. According to Skrobanek, the pantry serves residents within Harrison Township, East Greenwich, South Harrison Township, Mantua Township and Elk Township, with connections to the school districts as well as local low-income housing communities. Proof of residency is all that is required at this time to participate in the pantry’s offerings, open on the third Friday of each month between 9:30 a.m. and 11 a.m. When a guest shows up to the pantry, they will sign in and and be handed a form, differentiated by family size, to fill out their choice of foods. The form provides options for breakfast, lunch and what Skrobanek considers the “staples,” such as applesauce, soups, canned tuna or chicken and vegetables. While they wait for their boxes of goods to be assembled, the visitors are invited to attend a variety of programs, educational or community-based. Skrobanek said the pantry serves approximately 125 people per month, including children. Since the pantry does not collect food items through food banks or the government because it would require additional qualifications and the food must be purchased, all supplies and goods are donated from the community. Skrobanek said the reason YPATT has been able to keep the shelves stocked is because of food drives held by the schools and local organizations. As well, many of the food is donated by local businesses and farms. Those in need of food who live within the local area are invited to call the hotline at (609) 202–0015, or visit www.ypatt.org. Those interested in making a donation, or volunteering their time to the pantry should email Skrobanek at kristen@ypatt.org, or visit the pantry on Facebook.